It's been a long time since we had friends visiting who have an interest in tea! Our usual friends studiously ignore our curious tea-setup in the corner of the lounge. My cousin once asked if the tea-table was a writing desk, though. So, it was a distinct pleasure to have Mr. and Mrs. Nada pay us a surprise visit as their worldly travels took them close to our city. Tea al fresco was a very pleasant change. Nada has a charcoal burner from the talented Taiwanese engineer-turned-potter whose work featured in one of the first two issues of a tea magazine that I bought from Houde, long ago. The potter in question grinds rocks into his clay, and integrates driftwood and other cast-asides into his work to great effect. On the charcoal burner, one of Nada's two century-old tetsubin, my old faithful tetsubin, and Nada's charming silver kettle. 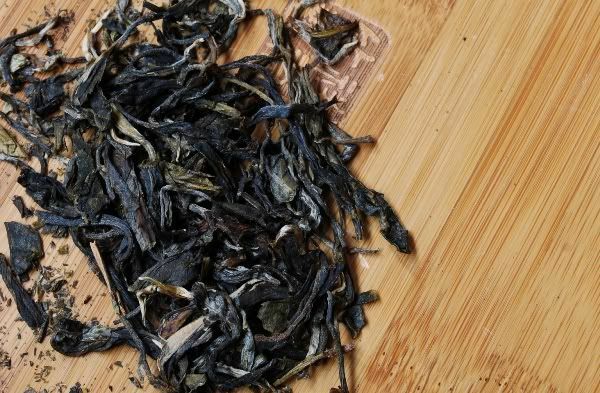 It was quite an education to try them all on the same teas: my tetsubin was a touch rougher than Nada's veteran tetsubin, while both gave a deeper, heavier flavour to the teas than the smooth, polished, almost brittle performance of the silver kettle. 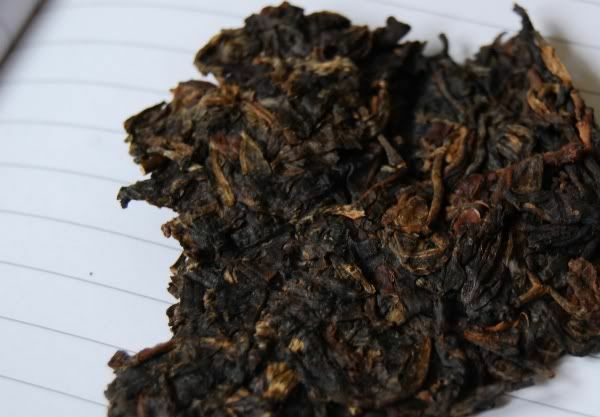 Thanks to Dr. Kim for a splendid 2009 Dayuling wulong (which is one of my personal favourites), originally provided by Teamasters, which we enjoyed. A 1970s wulong from Taiwan, then onto a 1930s (!) liu'an. The latter just keeps on marching, and I'm still infusing the leaves here in my office, two days later. 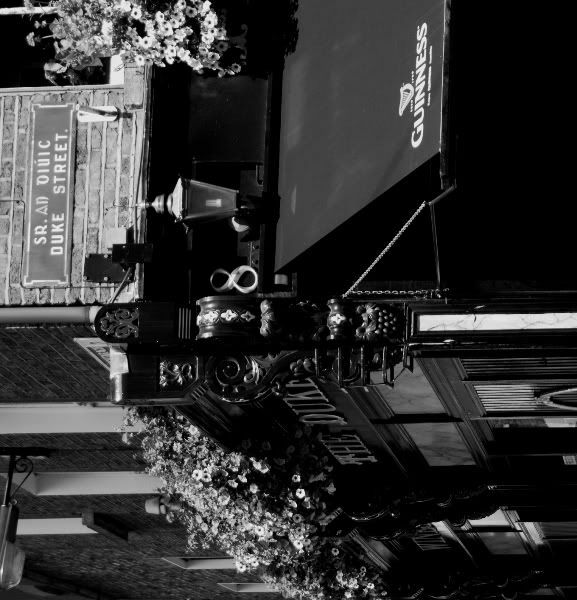 It's chaqi was quite something - after a while, everything seemed sharply in focus, and very quiet. 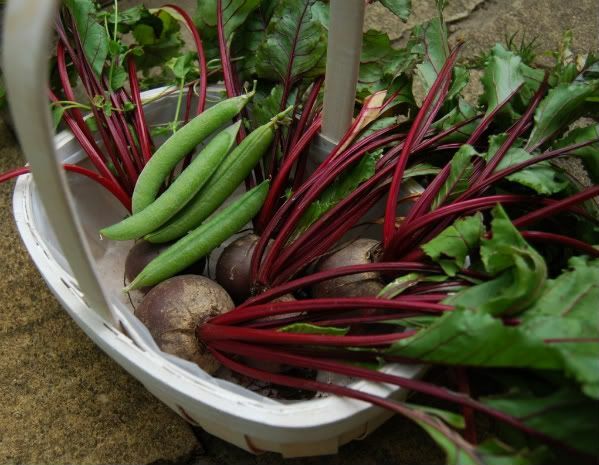 Finally, we picked some vegetables, and I got to work on my stir-fry skills. If engineering ever gets boring, maybe I can open "Laowei's House of Zhonglish Cuisine". And before we knew it, the evening was over. 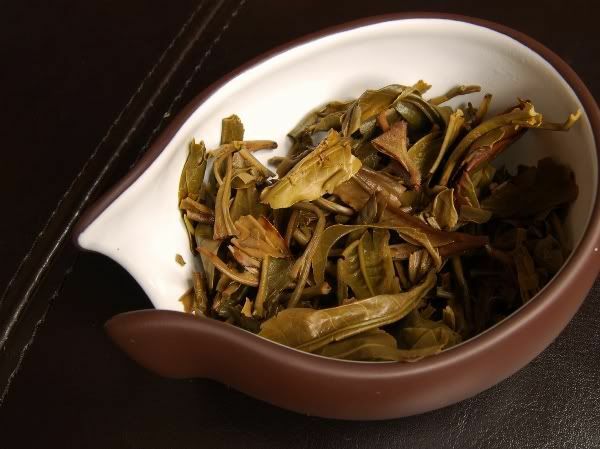 Late edit: I've since been background-infusing the 1930s Liu'an in a gaiwan in my office for four days now. 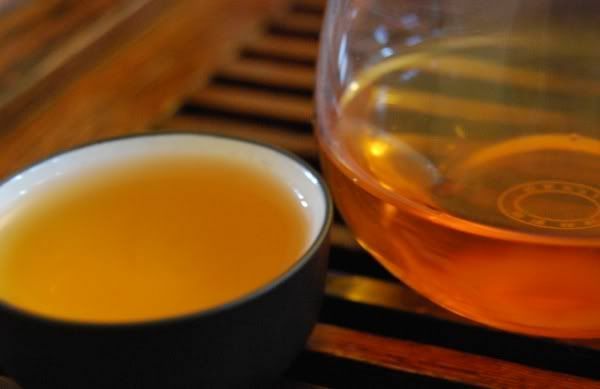 The colour has faded to creamy-brown, but the infusions remain smooth and woody, and my body responds to the chaqi in a remarkable manner. A singular tea! 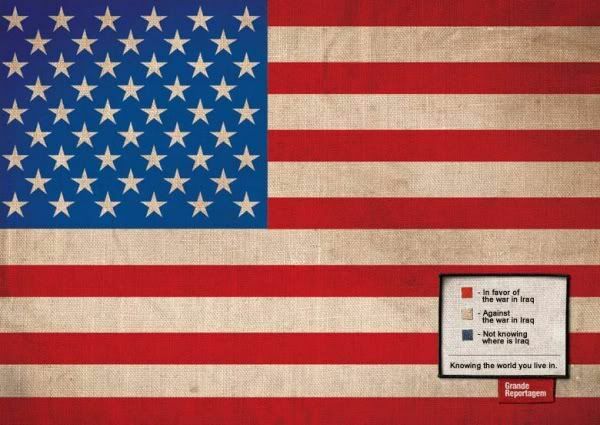 Amurca hao - tea of the brave, beverage of the free. The little label on the back tells us that this is "Nannuo Qiaomu". The price is low, at $13. If this qiaomu [tall tree / arbor], it's superbly inexpensive. If it isn't qiaomu, it's still inexpensive! 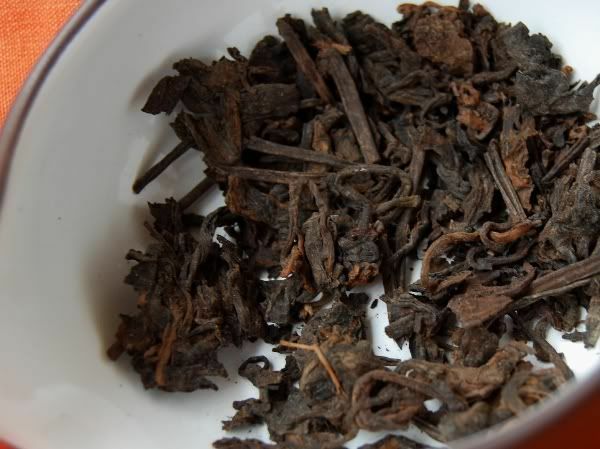 A brief aside on vendor-made cakes, seeing as we have examples from Nadacha, Puerh Shop, and now Yunnan Sourcing this year. I'm of the opinion that vendor-made cakes are a Very Good Thing. 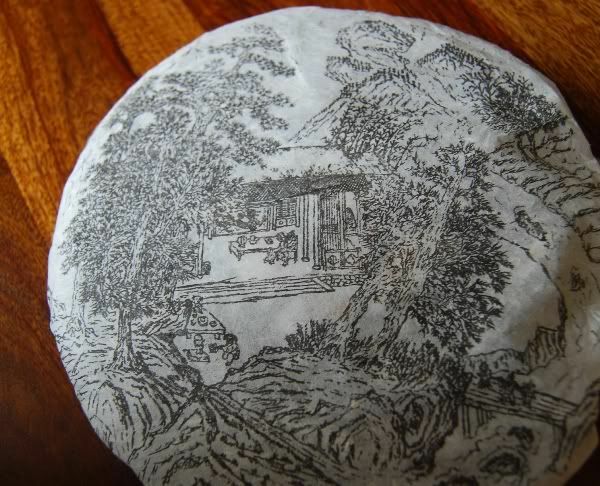 Normal "factory" cakes require at least two or three people taking a profit margin from the cake; e.g., a Xiaguan cake will require profit margin sufficient to cover (i) the tea farmer, (ii) the factory itself, (iii) the factory's distributor, and (iv) the final vendor (such as Yunnan Sourcing or Puerh Shop). When vendors make their own cake, they snip out (iii), and could well reduce the cost of (ii) as well. So, the bottom line price to the customer could be lower. Also, because the vendor has a personal stake in the cake, they are maximally exposed and therefore obliged to make it fairly decent. There's no hiding behind a big label if your own tea turns out to be a failure! Perhaps due to this personal stake, the quality of vendor-made cakes (for the price) often seems to be much better than factory runs. So, keep at it, I say. If it's cheaper to the vendor, then chances are it's cheaper to the customer, too, and (hopefully) better quality. 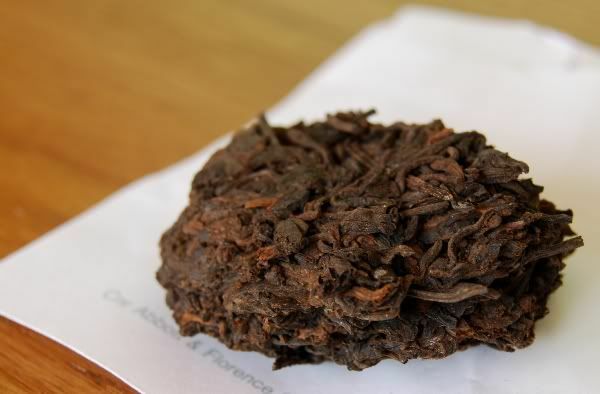 Looking at the cake, pictured above, we can see that it is a good mixture of whole leaves, with a few tips. Its aroma is straightforward: sweet and solid. It looks like a decent cake. It's time to relax. Week-end tea sessions are my favourite - I really only get to sit down at the tea-table on Saturday and Sunday mornings these days, with my week being spent drinking hongcha and shupu in my office. This makes the week-end sessions all the more valuable, and so each one brings with it the feeling of being a real treat. The soup turns out to be a pleasant yellow - it certainly hasn't been "Xiaguan'd", and it has a dense aroma of low, sweet leather. This is more like it! Floral, sweet Nannuo flavours fill the cup, and the texture is good and thick. There is a strong tang at the end, which flips over into a potent huigan. A touch of roughness dwells in the throat, making it feel a little raw. As the infusions pass, the tea tends towards a pleasant, but simple, sweetness. 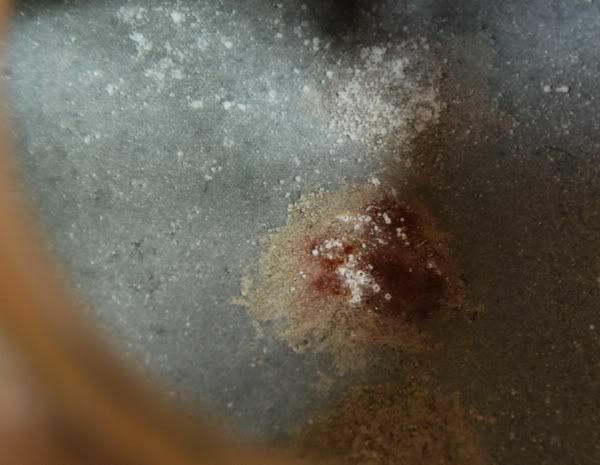 In conjunction, the roughness in the throat begins to dominate, and by the tenth infusion it has become particularly abrasive. "This is quite brutal", notes Lei, as she grabs a random cup in passing. It leaves a lovely, leathery scent in the nose, along with all that Nannuo floweriness, which I appreciate very much. It is unfortunate for this cake that I have recently had the 2009 Nannuo Qiaomu from Nadacha. 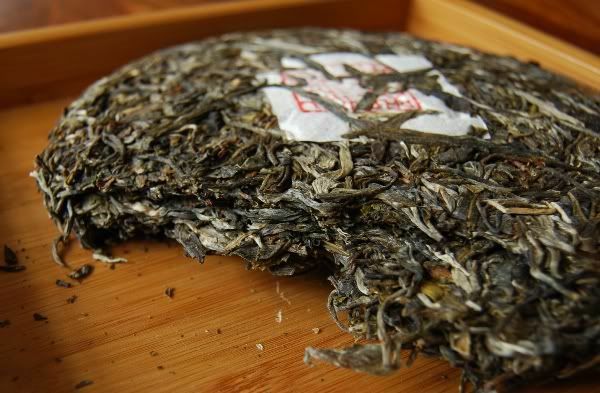 Whereas the latter is elegant, packed with content, and entirely free of abrasive characteristics in the throat, I found the Meiguohao to be quite hard going after the fifth infusion, though very pleasant at the start. The difference in quality between this 902 and the 904 is stark - the 904 being clean, smooth, and enjoyable. This 902 feels much more "down to earth", and I quietly doubt its claims to being qiaomu. 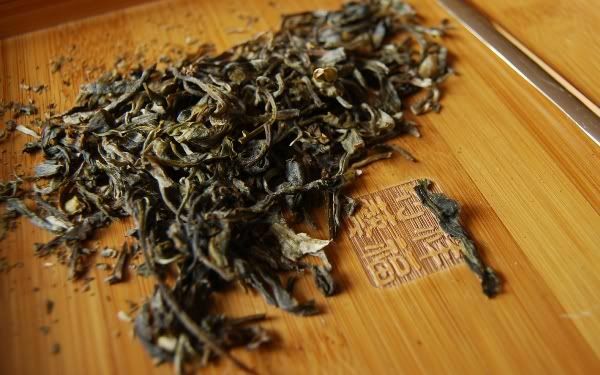 It has a muted, distant cooling sensation on the tongue as if it has some qiaomu leaf in it (indeed, if that correlates with being qiaomu maocha at all), but that it has been diluted. 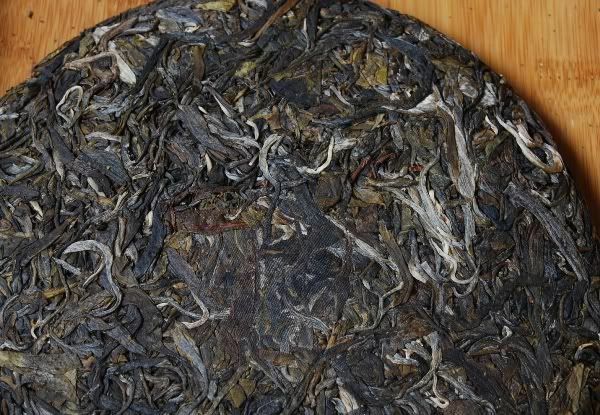 Buying maocha is a notoriously difficult enterprise, and Nada writes on his blog that even buying the leaves in person is no guarantee of quality, because the farmers dilute their qiaomu with taidicha [plantation] leaves. That said, the Meiguohao 902 is super-cheap. Perhaps comparing it to the more expensive Nadacha cake, and even the Meiguohao 904, is unfair because of the price difference. In comparison to other teas in its league (e.g., Dayi), it's a great tea for the price. Good value, and decent tea. Imagine, if you will, what heights could have been reached had Mozart survived long enough to complete his Requiem; what great works Van Gogh could have generated had he not died by his own hand in Auvers, France; what epic contributions to world culture could have been made had Ol' Dirty B'stard avoided accidental overdose - perhaps we could even be listening to a sequel to Return to the 36 Chambers. Sadly, we will never know. 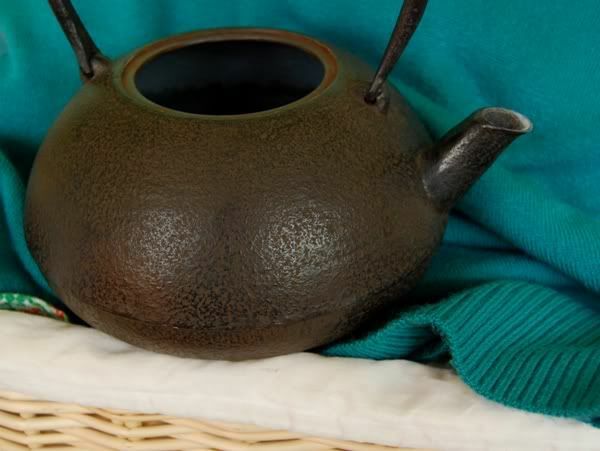 This 1980s Zhongcha, provided by the eternal kindness of ST, has reached that period of maturity that the aforementioned artists never reached. ST claims not to be very good with Chinese. 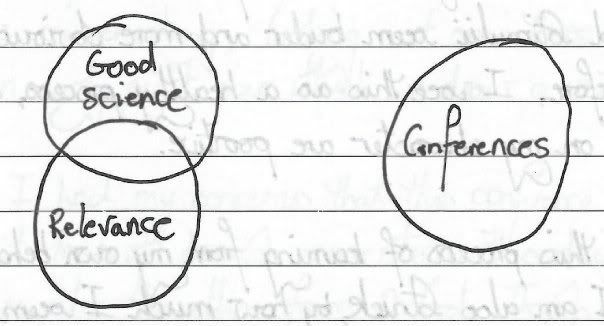 I submit the following photograph as "Exhibit A" in the case for the prosecution, in which we can see that his handwriting is actually really superb. 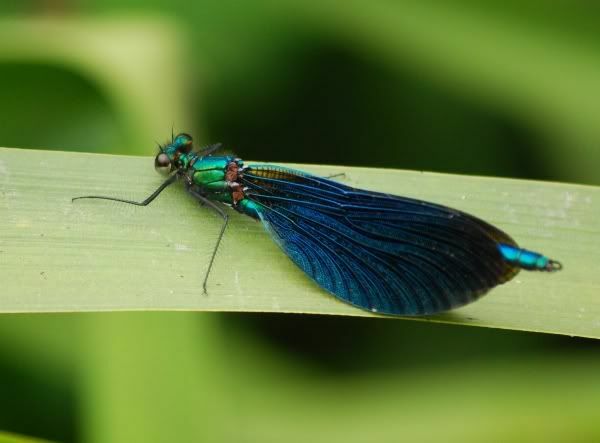 The leaves are very small and dark - take a peek at the photograph below. We can see the tight compression that they have undergone, shown by the imprinted texture on the face. The aroma is gentle shicang [sher-tsang = wet storehouse], as you would expect for a Hong Kong tea, which is where ST bought this cake. Like an old red wine, the colour of this tea thins out towards the meniscus (pictured below). My filter is blocked after the first infusion, testament to the extreme dustiness of some old teas. When will I learn not to filter the rinse?! The scent is clean, woody, and very soft - and it lasts a long time. I'm always looking for long, potent aroma and flavour. I like 'em dense, and interesting. Such are the beauties of shengpu, young or old. Taking me rather by surprise, I am accosted by a sudden and rock-solid huigan [hwee-gan = returning character in the throat]. It leaves fine mahogany scents in the nose. Top stuff. After a heavy/sociable night, this tea heals and patches me together, and soothes my stomach. To own a cake of this must be quite a privilege - many thanks, ST, for this superb encounter! 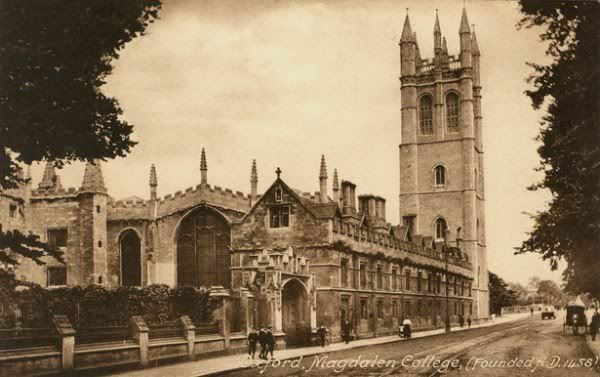 Magdalen ["maud-lin"] is one of my favourite places on earth, despite the fact that the *&@#ing bell in the Great Tower cuts through sleep like a hot knife through butter. 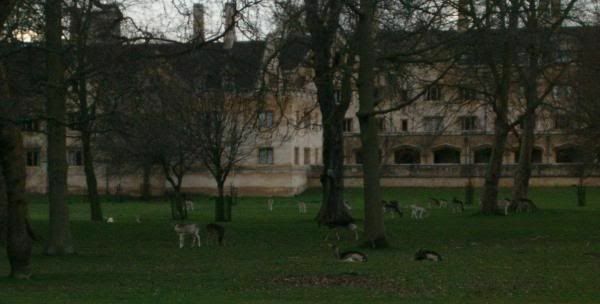 During World War 2, the college deer (pictured below) were famously classified as "vegetables", in order to stop them being requisitioned by the Government (who were understandably trying to control meat stocks). 2.5 hard days later, and we need some recovery treatment. We open the remainder of a sample sent generously by Warwickb. What better way to restore that which has been worn thin? Tongxinghao is an interesting one - it is an "ancient" brand, dating back to before the Cultural Revolution. There is a more modern imposter, trading on the Tongxinghao name. 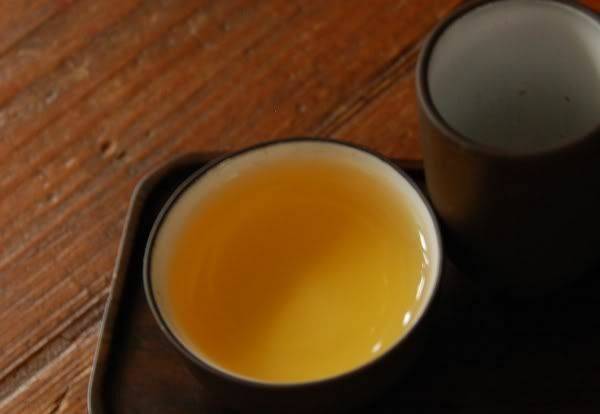 This tea, from the later end of the 1970s, falls between the old Tongxinghao and the new. I can only assume that the brand survived (?) the Cultural Revolution - but if you have any further information, it would be most gratefully received. 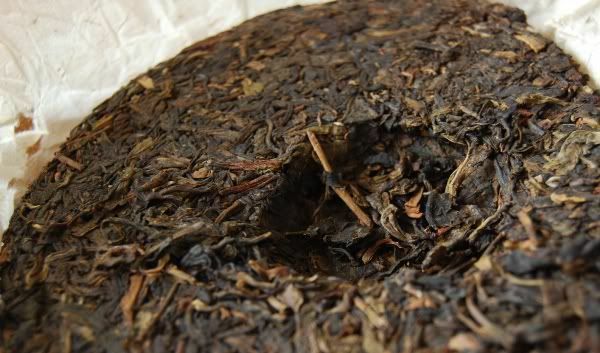 Warwickb noted that the leaves were grown on Yiwu, but we regularly read the caution that Yiwu leaves were not well-known prior to more modern cakes. So, who knows! No matter the brand history, the leaves themselves are believably 1970s - they have the orange rustiness of advanced age, and they have a light dusting of "golden flowers". You might be able to make out some of these little yellow specks in the above photograph (as ever, a click will enlarge it in a new window). 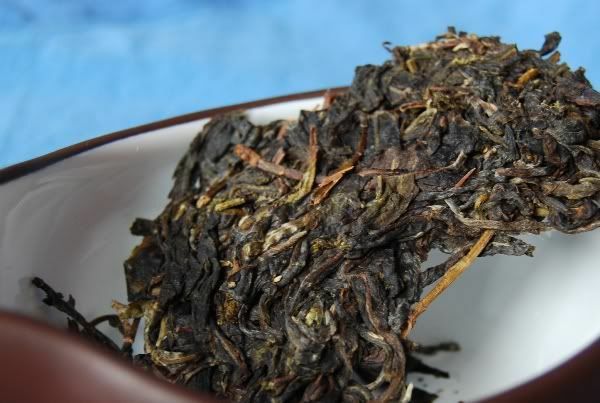 The blend is mostly made from small fragments of small leaves, and it has a thick, woody aroma. 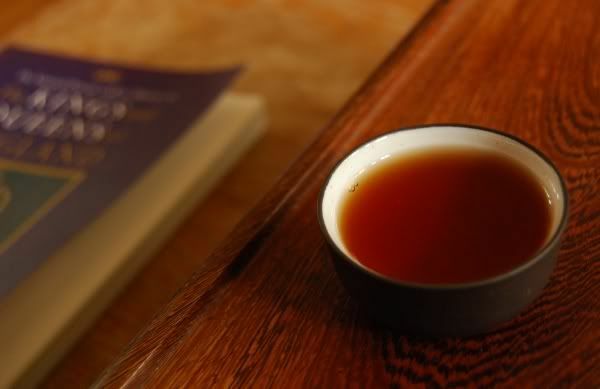 A fine dust settles in the chahe [char-her = tea lotus, the dry-leaf holder], but otherwise it is very clean. The leaves are surprisingly thick and strong - this was a very healthy tea. To drink this tea is to unwind entirely. While old and woody, it has a sweetness of such magnitude that I am startled. It hangs for whole minutes in the mouth and throat. The first cup (i.e., first three sips) pushed goosepimples onto the skin of my arms; the second cup (i.e., sips 4 through 6) leave my eyes wide open and alert. Curious physiology! My heart rate has noticeably slowed, and a feeling of deep calm descends. Sometimes when I leave old pu'er out overnight (in the pot), it becomes sweet and vanilla-like the next day. 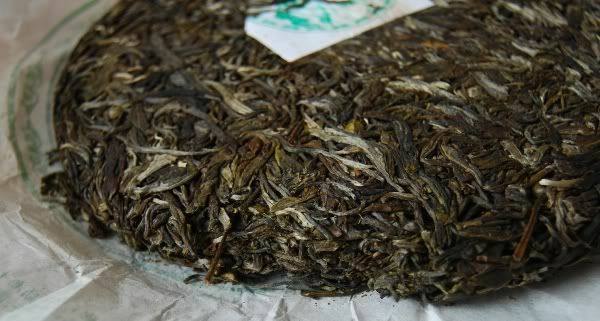 The sweetness of this Tongxinghao, however, is vanilla-like by the end of the second infusion. The tetsubin emphasises its smooth, creamy nature. Very many thanks, Warwickb, for your exceptional generosity. I don't know how much you paid for this delicious cake, but I'm sure it's worth it! I love summer - but I most love it when it's raining hard, and I'm cosy indoors. Distant thunder, the sound of rain hammering on the windows, and I'm nice and warm behind the tea-table. Today, we're celebrating Lei's change of citizenship. At dinner with my family, the subject of Lei's pending British nationality came up. I joked, "The average attractiveness of British citizens is about to increase!" My brother countered, "Why, are you leaving?" It's also my birthday. Let's break open another cake from Nadacha. Nada had some very pleasant wrappers printed this year - you may remember its sister illustration, the mountain-top teahouse from the 2009 Naka and the 2009 Yiwu Mahei. Nada writes that this tea is made from the same maocha source as his "Cha Chan Yi Wei" [Tea, Zen - Same Taste] cakes from last year. I think I remember reading on his blog that this was from a family venture, where they make their own cakes in the family home, including drying leaves on the roof! He also writes that the leaves (pictured above) are from 200-year-old trees, and that it is actual qiaomu [chee-ow moo = tall tree, arbor]. It's a great rarity to find qiaomu maocha from a reputable source; to combine that with Nada's price (this cake was around $30) is a fantastic opportunity, I think. 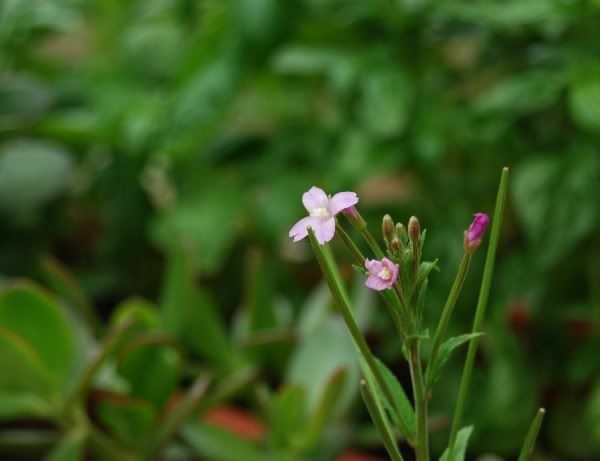 The leaves (shown above) are whole, and medium-sized. 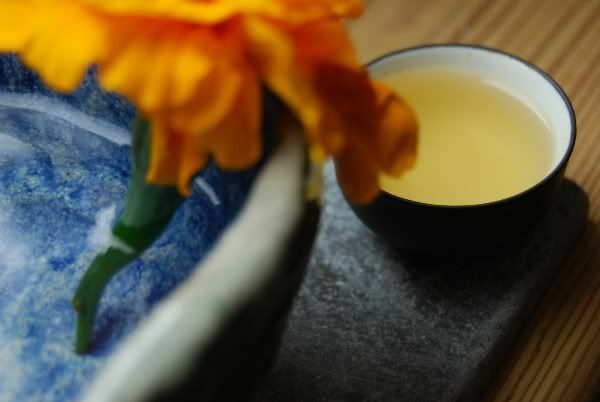 I love their fresh, floral aroma - this floral sweetness is something that I have come to associate with Nannuo tea. The compression is sociable: easily separable, but with good integrity. The aroma is solid and very full. Even from the aroma of the dry leaves, the sheer content of this tea is obvious. There's a lot in it, whatever that might be. Pure yellow soup (shown below) makes me happy. 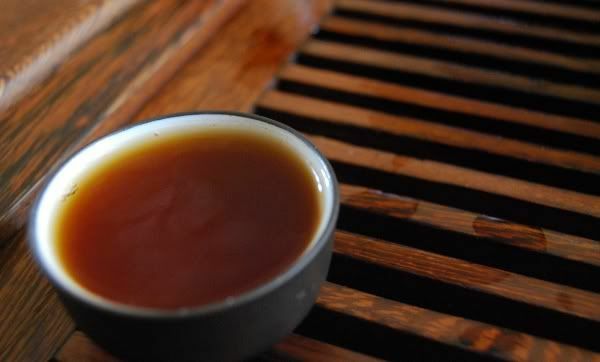 The sweet scents in the wenxiangbei [aroma cup] are so very long, they endure forever. The body is green - very green. It has a lovely sweet-leather base, with enjoyable floral notes over the top. A long pause... then an aching huigan. Chunky. An absence of roughness allows me to increase the amount of leaf that I use, and the body thickens even further. One zillion infusions later, and I'm still drinking the same leaves. Endurance, freshness, character. A tip of my hat to Nada for making a charming tea. Beautiful mid-length leaves, with a sweet scent. Surprisingly, its character is already tending towards being very dark and powerful, almost like sultanas. Its kuwei remains, but it is changing into a citric tartness. It is a chunky tea, yet tending towards that difficult age of being neither young nor old in character. Enjoyable and dark. 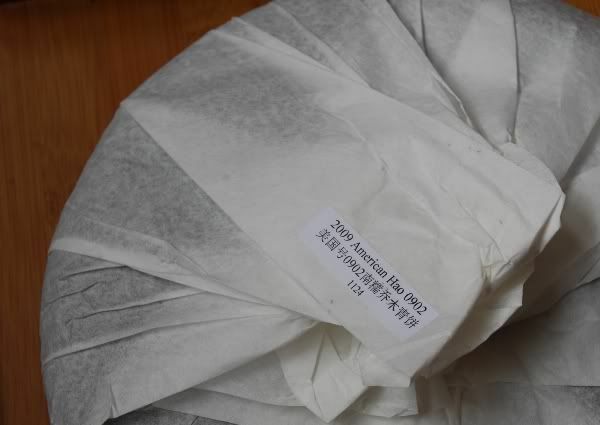 This is my index cake - the tea we've stored from the beginning, which I use to track the progress of our storage. It's an inexact and subjective measurement, but I hope it will act as an early-warning system for any undesirable storage effects. As ever, I have appended the new article to the original, so let's head over there. Imagine that I sold wine via the Internet. This year, I advertise the "Hobbes-hao 904", which you duly purchase from me for the sum of $43.98 (for argument's sake). You wait a few days, and the postman delivers a well-packed parcel. You're hoping for good things, because you've read my blog entries that described my trip to Bordeaux. Maybe I selected the grapes myself - perhaps even from old vines. So, you're hopeful. Personal productions are great, you think to yourself! What can this Hobbes-hao 904 be like? You excitedly open the postman's delivery to find a commercially-packaged box that reads "Blue Nun"*. It has a brand logo, a Quality Standard number, and the innumerable images and trademarks that such wines usually carry. It even has its own name, "Blue Nun Prosperous-Age Aromatic Wine" written over the front in big letters. Wasn't this supposed to be Hobbes-hao 904? 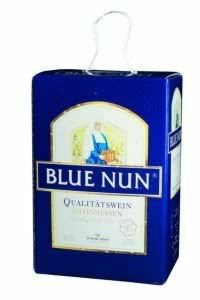 *Blue Nun is a crushingly mediocre brand of German wine that is popular throughout the world. You open the box to have a look at the bottle, to find that the bottle itself has a commercial label, and a commercial ticket telling you all about the factory (Blue Nun) and this "Blue Nun Prosperous-Age Aromatic Wine". Curious, you think. What happened to all that "personal production Hobbes-hao 904" stuff? You look over the box more carefully, and find a little white sticker on the back that reads "Hobbes-hao 904". You know that I love personal productions. The Nadacha teas are fresh and charming; the Maison de Trois Thes cake that I've had was really lovely. Yunnan Sourcing's own-brand productions are fun. Private maocha selections by travelling friends have all turned out to be most enjoyable. There's something wholesome about personal productions. Is this a personal production, or is it Blue Nun with a small label on the back? 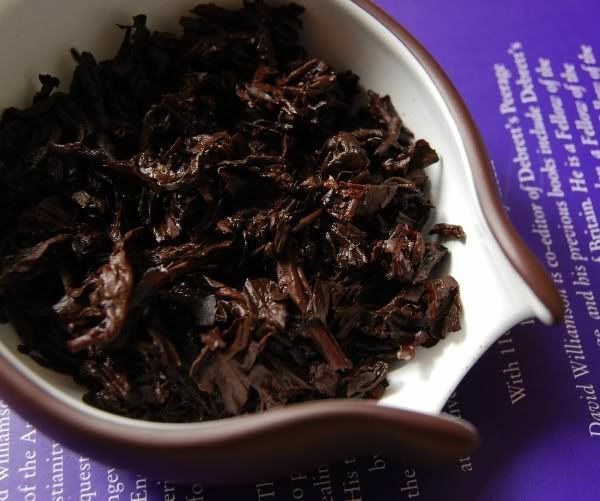 I'm aware that I my previous articles on teas from Puerh Shop have tended towards being quite negative. Let's have a quick look at that before we go on, because I don't want to seem biased: I was nonplussed by last year's Meiguohao cakes; I was surprised that a minor-factory Gujun brick was being labelled as "Douji"; and the Menghai Pengcheng was just another example of minor-label filler. However, I've also enjoyed the Douji "Dadou" bricks, and plenty of decent maocha from Puerh Shop. I hope it's very clear that my motivation is simply to describe the teas as I find them. This is a record for my own use, as much as anything, so I aim to be honest with my findings. 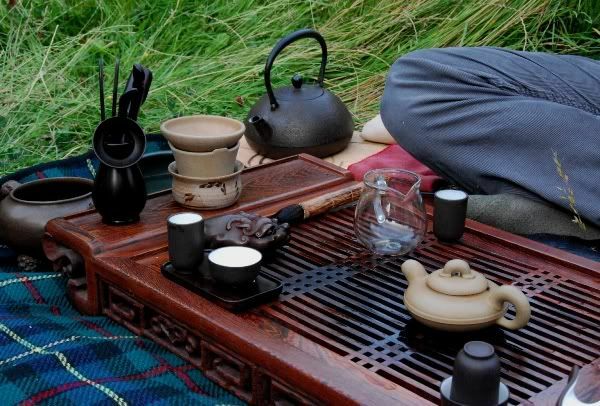 If my Puerh Shop comments are negative overall, that's just my impression of the tea and how that tea is sold - and I'm just one humble voice among many tasters more qualified than me. I admire the proprietor's dedication to tea, and the Puerh Shop "customer experience" is first rate in terms of delivery (and, often, price). That said, I have some serious problems with this tea! So, with due apologies to the proprietor of Puerh Shop, let me discuss this cake as I find it. I will raise some negative points, but this is because I believe that they should be raised. I'll continue to buy from Puerh Shop, but constructive dissent is healthy! Shown above, the only sign that this cake has something to do with Puerh Shop. It's the little white label on the back of a commercial cake. 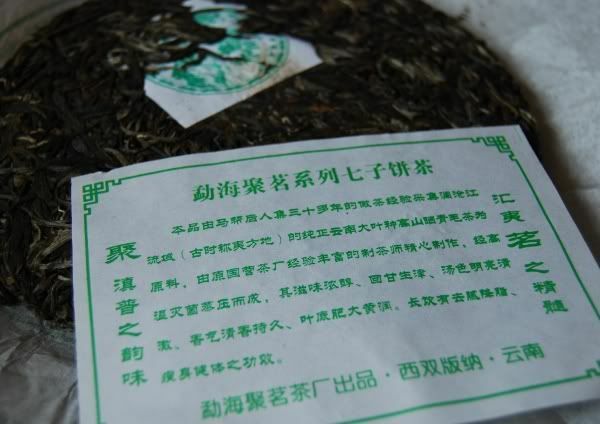 Pictured above, the commercial neipiao, telling us about the produce of Menghaixian Juming Tea Co.
Below, the cake (which looks great) and its commercial neifei. 1. 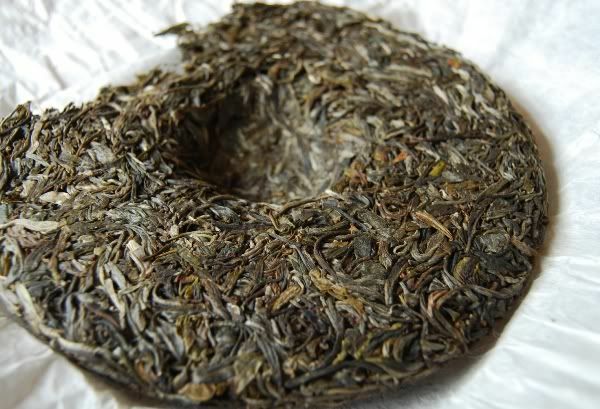 The product description says "this is the most expensive tea cake we ever made", and that "we called it Chengshi Mingxiang". I believe that representing to be involved in the manufacture of this tea ("we made") or the naming of this tea ("we called it") is, to be brutally honest, entirely disingenuous. This cake has been made by the Menghaixian Juming factory, under their "Xianxianhao" brand (which is clearly written on the front of the cake), and the cake's name that they have given to it is "Shengshi Mingxiang". I cannot see any involvement from Puerh Shop that justifies the use of "we". To make such representations is to mislead the customer. Is it an honest mistake, or is it willful disingenuity? 2. 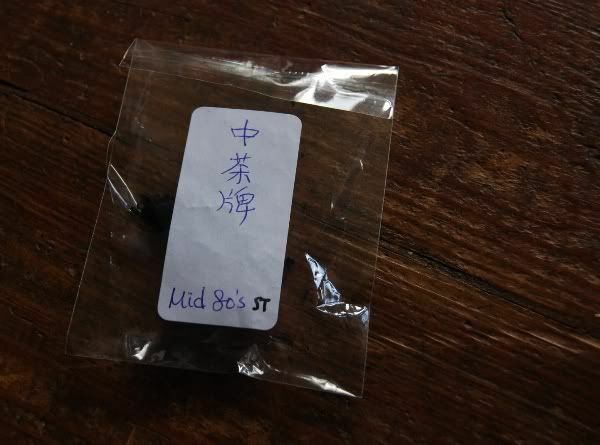 My Chinese is pretty rubbish, but if you'll allow me to correct Puerh Shop's translations (! ), the factory's name is Menghaixian Juming, not "Menghai Jiming" and the cake's name is Shengshi Mingxiang [prosperous-age], not "Chengshi" [ladel-age?!]. Sheng and Cheng have the same character, but totally different meanings (prosperous/flourishing vs. ladel/containing). If you named it, why do you use the wrong character for the name? In the absence of any other information, the above two points lead me to conclude that this is some chap's cake that has been purchased and relabelled. No big deal, relabelling is fine. Why claim to have made it, or named it, though? If, indeed, this is true, then how can it be "exclusive" to Puerh Shop? Concerns about disingenuity aside, the actual tea is really very nice. I can see why Puerh Shop are stocking it, even if it is under a curious relabelling, because it is tasty! The leaves, even at this hyper-green stage, are tasty. The majority are whole (pictured above), and they are strong. They impart a solid yellow soup (pictured below), which has a chunky, buttery scent of which you can be proud. 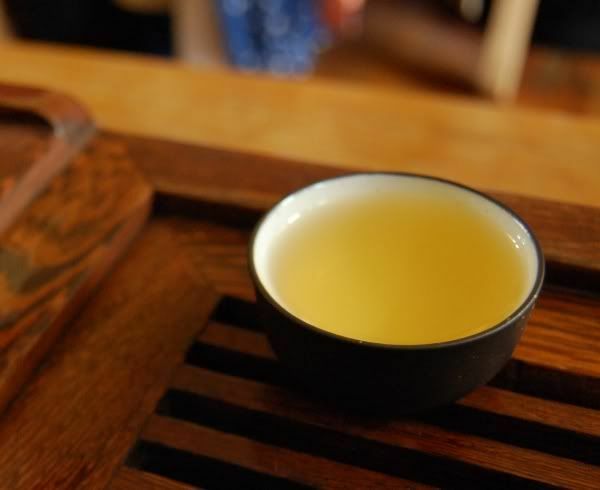 The tea marches on for a long time, delivering solid texture; creamy, buttery notes; and a fine huigan. It is punchy and enjoyable. Yes, it even reminds me of a tuned-down version of Nadacha's 2009 Mahei Qiaomu. So, we have a very pleasant tea (probably worth $43.98, if you're as used to Western prices as most of us), which is marketed in a potentially troubling way. 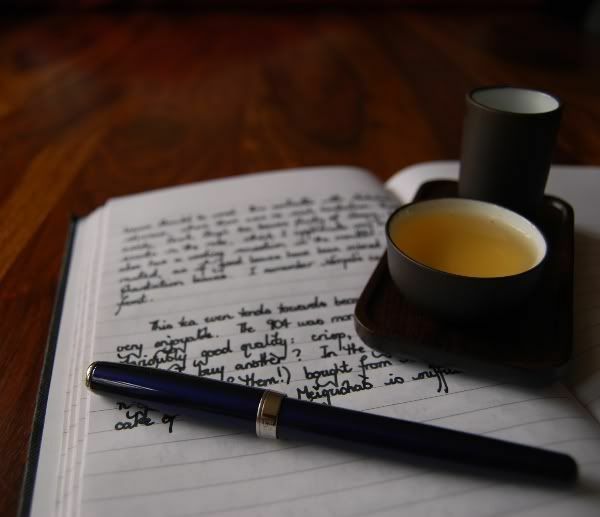 Once again, because I know the owner of Puerh Shop will read this: love the shop, keep up the good work, and please take my criticism constructively, in the spirit in which it is intended. No-one likes being criticised, I know, but I'd be cheating my readers if I weren't honest in my opinions. 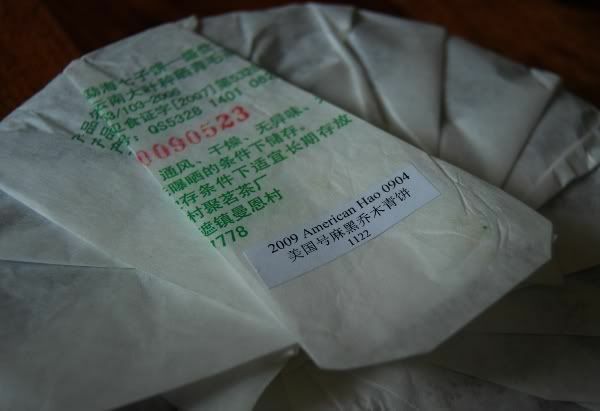 "Drinking an American Hao is every tea enthusiast's envy for joy." It's time to check in with our old friend, Mr. Tetsubin. He's been in use for about half a year (to excellent effect! ), and some changes are taking place. 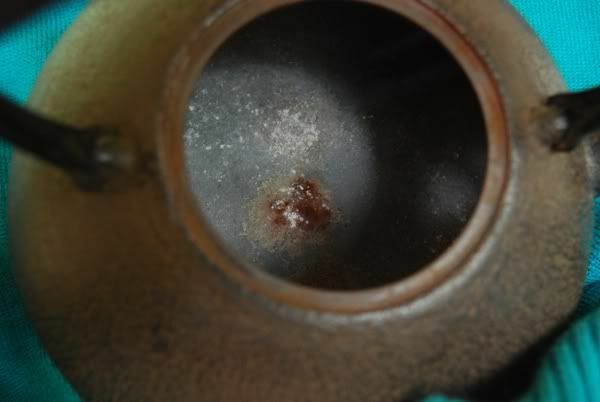 Firstly, look closely at the spout: it's getting whiter. Even after thorough drying each session, this sediment is accumulating. No big deal, but one of the more obvious signs of use. It's getting slowly coated, despite using bottled water for the tea-brews, and filtered Brita water for the initial rinse. The knowledgeable chap from whom we bought the kettle forewarned us that this would happen, and that it was normal. 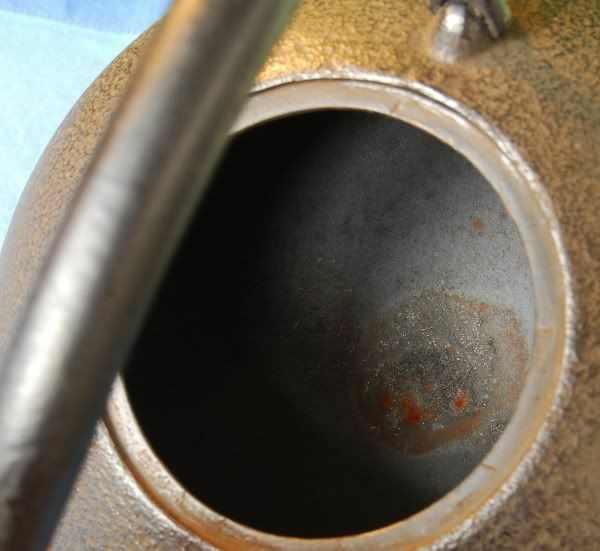 We saw images of particularly old kettles, which are bright white on the interior. It's fascinating to see how even a kettle ages along with everything else. We've become very well accustomed to the character imparted by the tetsubin, and I can thoroughly recommend it. As always, I suggest giving one a try before taking the plunge, because there is a change in the water, and you might not like it. Also bear in mind that I primarily drink shengpu of various ages, and appreciate a rounding, smoothing emphasis. It supports the woody notes of good shengpu, and takes the edge off any roughness or acerbic notes. 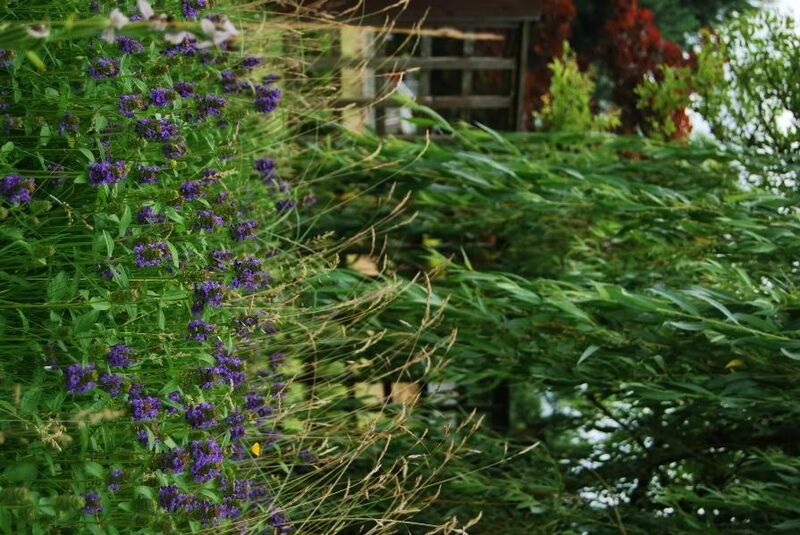 Everything appears to be passing through a period of maturity during these summer months. "How important is it, do you think, to be able to communicate and discuss your work with new people, rather than just researching? That is, what importance would you place on the 'soft skills', such as discussion and conversation, in comparison to your scientific skills?" It's a bombshell question, which interviewers sometimes like to drop and then walk away from, to see what manner of carnage is caused after the detonation. I blagged my way through, to the panel's seeming approval (got the job! ), but remember using the dreadful words "proselytise" and "evangelise" with a straight face, much to my later embarrassment. While digesting the interview in retrospect, I realised that the most successful people I'd admired before (academics, industrialists, or otherwise) spent a lot of time emphasising the "soft skills". They were very smooth, in dealing with everyone from the nurse on the hospital floor to the CEO of a national body. 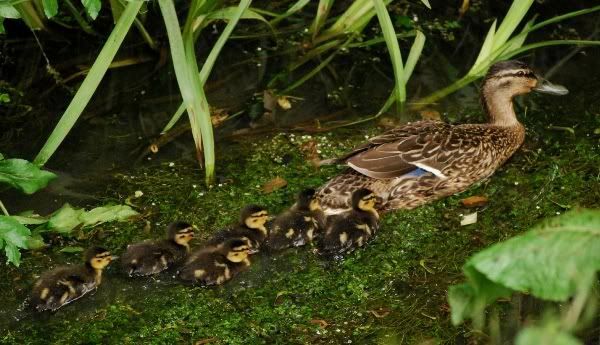 The soft skills aren't explicitly taught at university, excepting the odd random little course, and instead they slip in unnoticed by other means. 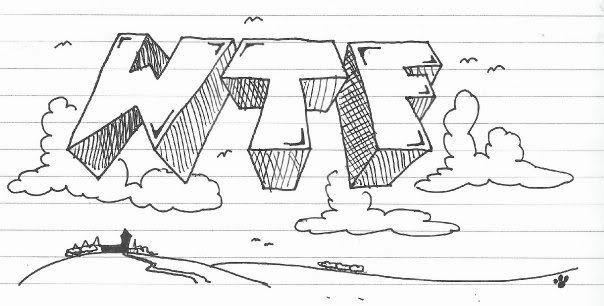 What other means? My university attracts quite a lot of criticism for being what the critics call "nothing but a dining club". 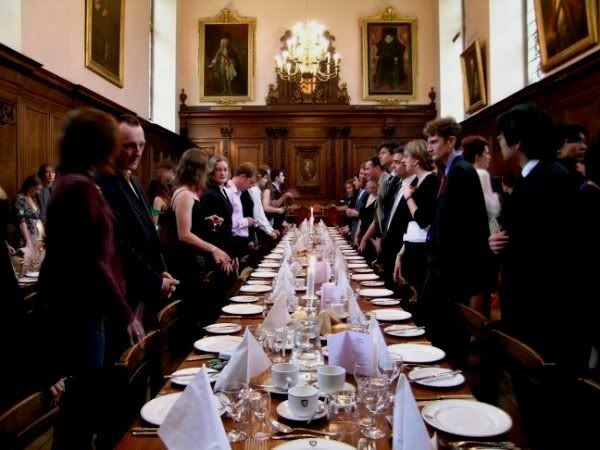 To an arguable extent, this is based on truth: the social aspect of academic life with people outside your discipline is emphasised, with most members of the university having formal dinners at least once or twice per week during term. It's good fun, and you get to talk to people who aren't engineers, which is great. Engineers are nice people, but when you've spent all day with them, a change is welcome. It's at the dining table that I reckon you get a surprisingly large amount of practice at the "soft skills" to which the old professor was alluding. The more you speak to people - particularly new, interesting people that you've never met - the easier it becomes, and it builds confidence. Most importantly, it knocks the rough edges off you. It helps you to get on with strange people. It makes you less of a pain in the backside. It's not so much about the food. We recently had the "Going Down Dinner" at my college, which celebrates those who are leaving the college ("going down") this year, including your humble correspondent. We have loads of Americans with us, and so the name "Going Down Dinner" is understandably very amusing to them, given its modern meaning over there. Sniggering aside, it's a great opportunity to see all your old chums from the past 3-5 years, and wish them well in their lives after leaving. It's a long old event, followed by speeches from various folk in various states of inebriation, concluding with the college Master wishing us all the best. The Master is a lovely old chap, a near-retired geography professor, and I happened to be sitting opposite him this time, with a few other doctoral students. "And now, the Grace. 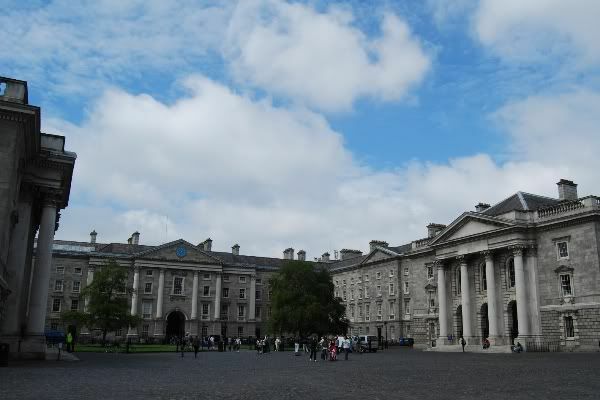 This time, it will be read by a departing student, who is defecting to another college*." *Which is about 200 yards away. The drunken and burly crowd, superbly intoxicated with port, shouted "Boo! Traitor!" And then the Master passed me the Grace. 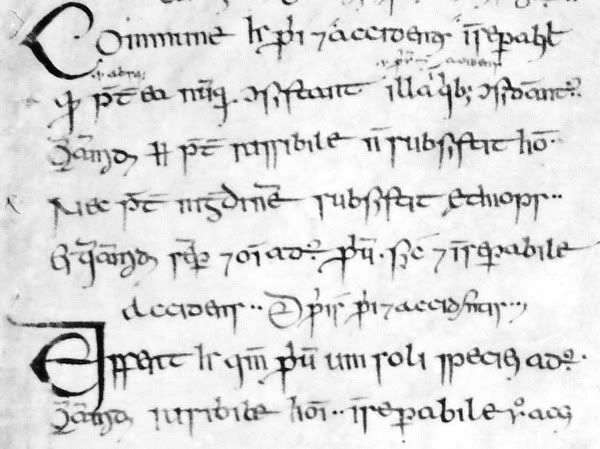 One and a half paragraphs of Latin. The next morning I was in dire need of a cure. The mighty ST came to my rescue - thankyouthankyouthankyou. It's as black as your proverbial hat. 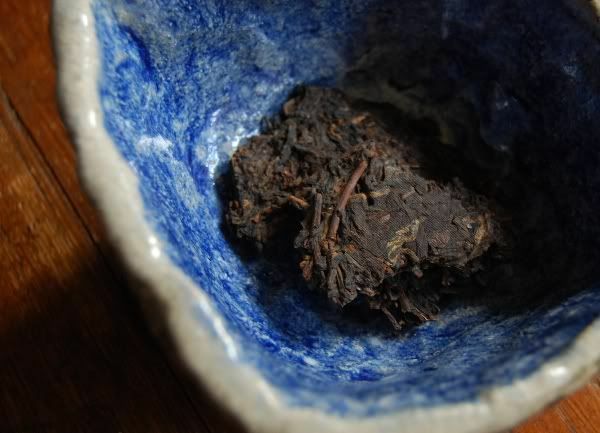 This dark little fellow is from 2002, and comes as a pair of zhuancha [djoo-an cha / bricks] wrapped in bamboo. ST grabbed them for Singapore$40, which comes to about US$27. The "bargain" radar is lighting up. Tight! Tight, tight. 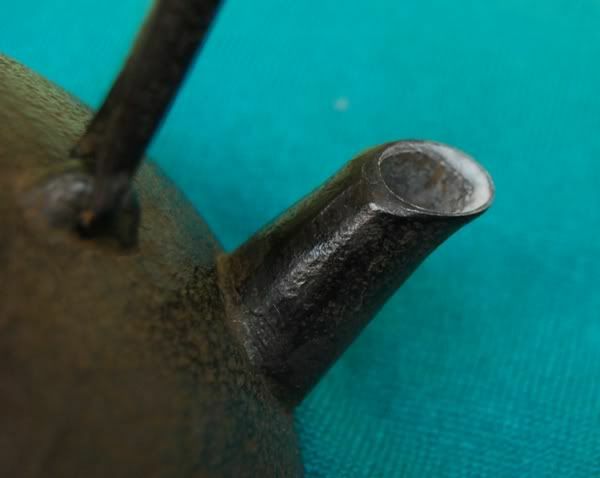 The compression is old-school Xiaguan, and constructed of tiny leaves, as pictured above. It has a superb woody aroma - clean and sharp, and indicative of good* storage. *I say "good", but I mean "dry". I like wet-storage, too, as I'm sure you know. 'Tis mighty woody for a 2002. That woodiness comes out in the aroma, which is clean and sweet. Shown above, the soup already has a decent orange tinge to it - presumably not achieved through a late shaqing, given the cleanliness, sweetness, and lack of malty "redness" in the flavour. Good stuff. I'm convinced, where do I sign?! I love the spicy, woody flavour, which swells to a very decent huigan. ST called this "quite a mouthful", and it definitely packs a lot in. Sweetness above, plenty of goodly scents left behind to dwell in the nose. 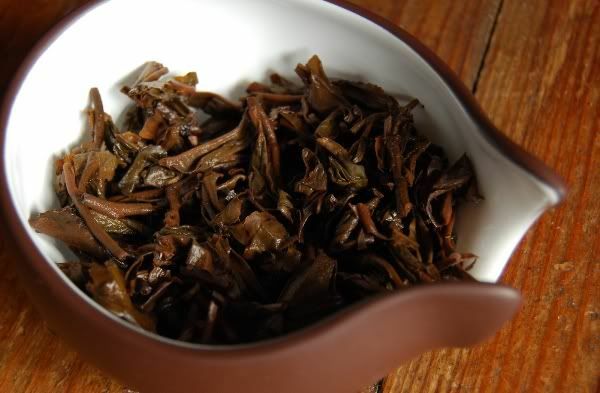 Again, the tetsubin has complemented the tea very well, with noticeable notes from the kettle smoothing out the edges and making it almost creamy. "This is very clean and smooth - can we get some?" sayeth She. No roughness, just plenty of smooth wood, lasting well out past the 15th infusion. At $13.50 per 250g brick, this is a real bargain. Many thanks to ST for sending this my way... hopefully to be joined by a few of their brethren! A real soother after a torrid, yet highly enjoyable, Going Down. 2009 Mingxiangyayuan - Hailanghao "Zhang Jia Wan"
Trinity College is beautiful, too. I've never seen Georgian architecture on such a scale, without mixture of other architectural styles - it's as if it has been lifted out of the past, and perfectly preserved, without later addition. The UK academic community in my field is fairly small, and so the same faces keep cropping up at most conferences, which is nice. Most people are connected to one another through two or three steps, which makes for a friendly atmosphere. Enjoying the peace of being back at home, Lei and I decided that the only real benefit to going away is to remind you how much you love your home. 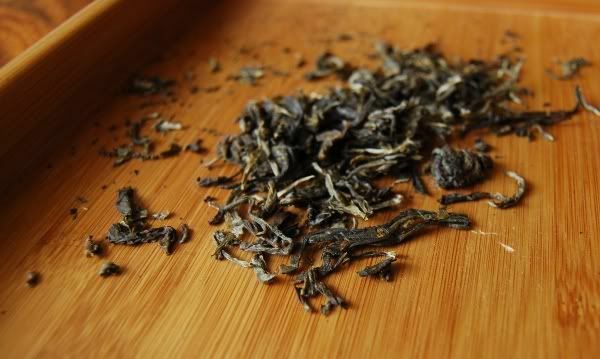 Huge uberthanks to ST for providing this sample of Hailanghao's "Zhang Jia Wan", sold by Yunnan Sourcing for the heady sum of $74. 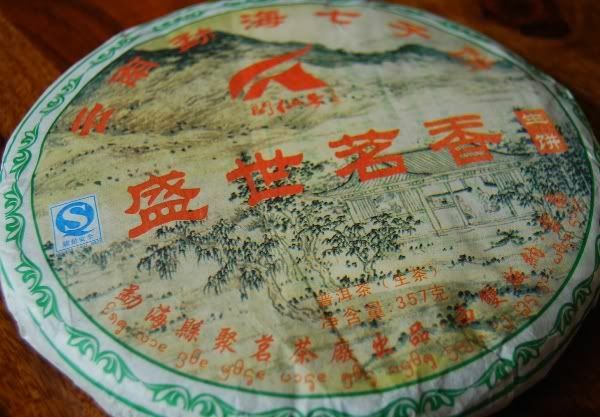 It is part of an unholy trinity of limited-quantity Hailanghao cakes, including a Manzhuan for $64 and a "Gao Shan Zhai" tea for heaven-knows-how-much. The price is a big sticking point, and obstructs my approach to the tea. 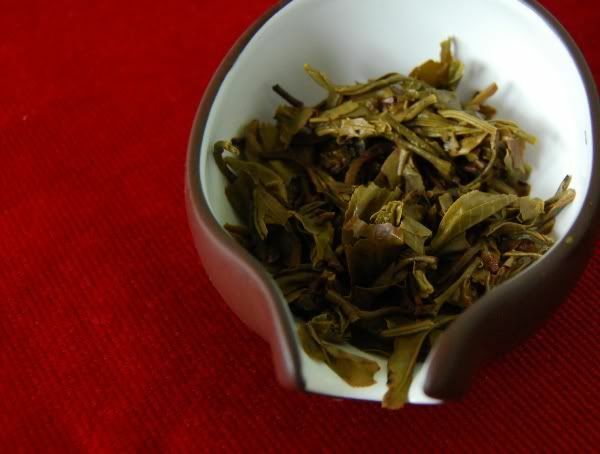 Ordinarily, I like Hailanghao teas (as you've probably guessed from my numerous previous articles on the subject), because they are low-maintenance, enjoyable, and inexpensive. I wouldn't have thought that the quality of Hailanghao could ever aspire to the "serious cake" prices attached to these cakes, but I'm willing to be proved wrong! Chums have looked at the prices and commented "I won't be buying those." I guess these cakes are for the real Hailanghao fans out there. I consider to be myself a card-carrying fan of Hailanghao, and so I hope for great things, despite my suspicions. 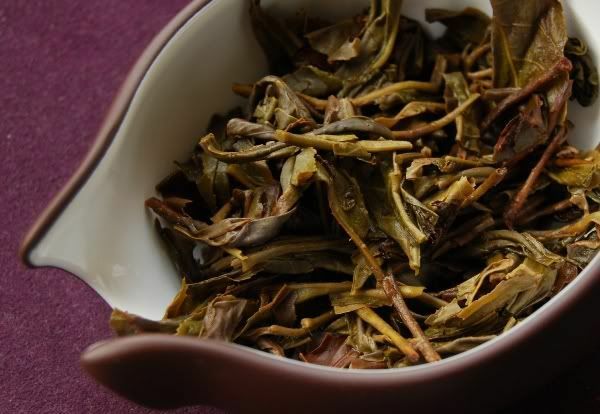 The extraordinarily high price means that the tea comes under a bright spotlight - much moreso than, for example, the inexpensive Hailanghao of previous years. Can dear old "HLH" make the jump into the big leagues of expensive cakes? Those leaves shown above are dark and appear in large fragments. They are leathery-sweet, and darkly grapish - very young and clean, but certainly very "green". Perhaps it doesn't come out in the above photograph, but the soup is a melon-orange colour suggestive of sourness. Indeed, it is a bit sour - particularly in the throat, where it seems rather abrasive. Most obvious is a great big pile of buttery sweetness in both body and aroma, which rather reminds me of a Dayuling wulong I had from Teamasters some years ago. This heads nicely into a savoury, grainlike character. I could believe it is Yiwu, but it seems a touch unusual in its butteriness (in a decent way). ii. it is lacking in content, and I had to add more leaves than usual, and brew harder than usual, in order to get much out of it. It is a very difficult cake: its thinness means that you need to push it quite hard, but it doesn't stand up to stress, and rapidly becomes sour and rough. Noting the extreme price of this cake, I couldn't recommend it. It has the usual flaws of Hailanghao, being none-too-potent, and none-too-smooth. At the ordinary Hailanghao prices, these are entirely forgiveable, and I have bought many solid performers of this brand over the years. At $74, this tea simply is not up to par. It's high price must surely be a function of its rarity (YS listed 13 cakes) rather than its quality. Thanks again to ST - I can understand your disappointment!